listening out for whatever is happening to our days? For goodness sake, will it just make up its mind? Is he staying out or coming in, to rug or not to rug? 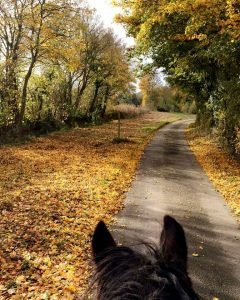 You spend half your time worrying whether your horse is too cold without a rug, and the other half worrying that he’s too hot now you’ve put it on. But what do you do!? Clipping – When do you start? What will you do? Remember to dress properly otherwise you’ll be itching in that jacket for the next month. You find yourself browsing country boots/mucking out boots/funky wellies on your favourite websites. Well, your old ones are knackered. Oh and look at them cool Faux Fur boot cuffs! Hmmm, maybe you need a new coat? WOW – Waterproof breeches!? Defiantly NEED these! Woohoo, the flies are going – Adios amigos!!! Of course It rains for days non-stop so you panic, buy loads more rugs and the sun makes another appearance – Great! Well at least you’re prepared! 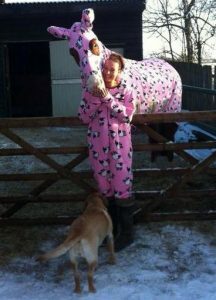 Once you’ve started you consider buying one of those silly (but actually quite cool) Snuggy Hoods pony onesie/jams. After all, they do keep them cosy & warm! The rubber stable mats are back out – They’re SO clean! Don’t even think about the state they’ll be in, keep calm and carry on! You’re sad its the end of the competition season. Oh well, at least the hunting season is about to start. Talking of which… So is the shooting season & that means pheasants bursting out out hedges every-blooming-where! OH, and it’s time to decide (AGAIN) whether hosing his legs off is more likely to cause Mud-Fever than letting them dry and brush off? And as for you, you deserve a nice warm, relaxing bath once you’re in from the cold, wet yard. Look out for that floating bit of hay, and ‘Eww, what’s that’! ?